Andrea Labiste Teme, a May 2017 bachelor's candidate in general management and operations and supply chain management with a minor in French, Encarnación, Paraguay, is the Kansas State University College of Business Administration's Outstanding Senior in Business for spring 2017. The award is presented each semester to a graduating senior who has made notable contributions to the college. The list of Labiste Teme's accomplishments as an undergraduate are extensive. She was selected for the college's 2017 Mentee of the Year Award, which recognizes the student who models the expectations of the Executive Mentor Program — initiative, good communication and the drive to develop oneself professionally. In addition to her degree, she has earned the Professional Strategic Selling Certificate and the Professional Advantage Certification from the college. While an undergraduate, she has been an excellent ambassador for the college and an exceptional student scholar. She served as a Business Ambassador, a Sales Ambassador, an undergraduate research assistant, and the secretary of the Global Supply Chain Club. She was chair of the open house committee for the college, and is a member of both the Phi Kappa Phi and Beta Gamma Sigma honor societies. She has been active in the National Strategic Selling Institute's Sales Cat team, taking part in numerous competitive sales competitions, and earning first place at the Frito-Lay Sales Competition. Labiste Teme also has served as a sales teacher assistant. She was recognized as one of the top 10 students in the sales program in 2017. 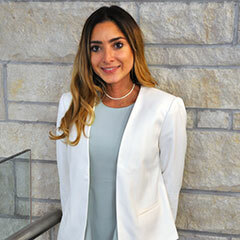 A native of Paraguay who speaks five languages, she has been an authentic and exemplary advocate for diversity in the college and at K-State, serving as an International Student Representative on the Diversity Programming Committee. "I've really enjoyed meeting and working with great people here at K-State as well as exploring and being a part of so many of the great programs we have available here in the College of Business," Labiste Teme said. "As an international student from South America, I felt it was important to get involved as much as possible to take advantage of my time here." Following graduation, she will return to Paraguay where she will put her language skills to use in international sales for her family business with her parents, Oscar Labiste and Rossana Teme. After a few years in the workforce, she plans to go back to school to obtain a master's degree somewhere in Europe. Event gives voice to Kansas State University veterinary students in Washington, D.C.
Military affairs executive director invited to participate in National Veterans Convening in Washington, D.C.